Bedtime Snacks: Are They Safe For Your Child? You’re about to put your child to bed … but they are hungry, begging for that one snack that will not only fill their tummy but taste good too. Sometimes I give my kids bedtime snacks … but if you ask them, they’ll probably tell you they aren’t the kinds of treats they’d pick! However, they know why we avoid certain foods. I always go for low-sugar snacks. That’s because sugar will attack your child’s teeth while they sleep — and that can lead to cavities. Why is it important to give your child a snack if they need it? Because going to bed hungry can affect their quality of sleep. I only see it as an issue if they decide to skip dinner because they know a treat is available later. Don’t let them start that habit! If your child somehow manages to sneak a sweet or drink an unhealthy beverage, make sure they properly brush their teeth before crawling into bed. Then remind them why it’s not good for them. If they are thirsty, stick to water. If your child is an infant, make sure they finish their bedtime bottle before bed. Having trouble convincing your child to brush before bed? Surprise them with a colourful, children’s-themed brush and toothpaste. If they see their favourite Disney characters on the bottle or are enticed by a mouthwatering toothpaste flavour, that might be all the convincing it takes to get them to spend two minutes on their smile. Looking for other bedtime snack ideas? What healthy options do you currently offer your little ones? Let us know! As your preventative dentist in Bowmanville, I’m always looking forward to listening and sharing with you. In the summertime, my kids and I spend countless hours in our garden. They love running around, checking out what has sprouted … and even eating it, too! Ripe, juicy tomatoes are their favourite. They enjoy them as a healthy snack right before a meal. Tomatoes are low sugar, so it’s great! If you’re unsure of which fruits and vegetables are best for you and your child’s smile, read on. I’ll let you know what’s good for your smile and which options could be problematic. Leafy greens are an excellent choice for you and your child’s teeth, as well as your overall health. Calcium-packed options, which strengthens tooth enamel, include spinach, kale, okra, white beans, and soybeans. Mushrooms contain vitamin D — also known as the “sunshine vitamin.” This vitamin is essential to maintaining healthy teeth and bones and it helps our bodies absorb phosphorus and calcium. Carrots and apples are high in fibre and crunchy. Eating them promotes saliva production, which neutralizes bacteria-laden acid, reducing the risk of cavities. Ginger helps minimize the acid in your mouth by neutralizing the acidity formed by bacteria. Citrus fruits can pose a danger to your teeth because they are very acidic. This high acid content may break down your tooth enamel over time, which can lead to decay. It’s not all bad though … these fruits and juices contain vitamin C and other nutrients that are good for your body. My advice is to rinse and brush after eating to prevent erosion. If you have a small garden at home, I encourage you to introduce your kids to it! It’s a great way to soak up the sun, be active, and show your child which foods will keep them smiling! If you don’t have your own garden, there are some great videos on YouTube to help you get started. Have some gardening tips you’d like to share? I’d love to find out what they are during your next visit toLongworth Dental — your Courtice dentist. Do you know how to best care for your child’s smile? Interested to find out how brushing and flossing could be made easier? As a dentist with a passion for working with children and mom of three, I know just how important it is to help them along until they are able to properly care for their teeth and gums. According to the Canadian Dental Association, cavities account for one-third of all day surgeries performed on children between the ages of 1 and 5. In this blog, I’ll share some tips to help you provide your child the best oral hygiene routine possible — so they can avoid dental problems and are set up for future smile success! Start cleaning your child’s teeth once they emerge. Using a soft-bristled brush, you should brush once in the morning and before bed. We can provide guidance on your technique when you come in to see us at Longworth Dental. We can also advise you on fluoride use. One thing’s for sure … give the molars plenty of attention! Cavities often develop in these teeth because they are ignored. I find that when we let young kids brush their own teeth, they don’t brush long enough (two minutes is recommended) and they miss surfaces. My daughter Aria lets me brush her teeth at six-and-a-half years old … because she knows how bad cavities are — and because she enjoys it! Get your child to sit on a counter or lay them on a bed. This makes it much easier to access the teeth. Have them tilt their head back when flossing the upper teeth. Then you can get a good look at those cavity-prone molars. Tilt their head down, so they are at eye level with you, when flossing their lower teeth. Use floss sticks or picks. It can be more challenging to use string floss. The mornings and evenings you spend with your child to help them care for their smile make for a great bonding experience and reinforces healthy oral hygiene habits! Once you’re done, let them watch you brush and floss your teeth. This will show them how important it is to keep it up! Have questions about your child’s oral care? As your dentist in Courtice, I encourage you to give us a call and ask away! I look forward to being a valuable resource to you and your family. A child’s first visit to the dentist can be a very scary and intimidating experience. But it shouldn’t — and doesn’t have to — be. At Longworth Dental, we’ve fostered a child-friendly environment — where all kids are cared for as if they are our own. Dr. Sharon Barr’s wealth of experience improving children’s smiles through various outreach programs coupled with the fact she’s a parent herself, gives her the insight and compassion needed to connect with younger patients during their treatment. Dr. Andrew Cooper is a parent as well, so he also knows how to put kids at ease. We recommend you bring your children to see us by their first birthday (or six months after their first tooth has come in) for a complimentary “Happy Visit.” This is offered to every child under the age of three. What happens? It’s a chance for your little one to play around in the dentist’s chair and become comfortable in our surroundings. We will examine their teeth, detect and treat any problems, encourage your child to be curious, interested, and proud, and give you tips on keeping their smile healthy. If you bring your child in at a young age, we can eliminate any fear, unease, or misconceptions they may have learned about the dentist. At our office, they will quickly discover what a fun learning experience it can really be — and that this is a place they’ll really want to come back to! Before your child’s first visit… There are some things you can do to prepare and help them avoid feelings of fear and anxiety. Make sure they get a good night’s sleep. Give them a high-protein meal before coming in. If there are any questions or concerns you have about your child’s smile, write them down so you don’t forget to ask. There is no such thing as a bad question! If your child takes any medications or has health conditions, be sure to jot them down. All this information will be helpful in developing the right treatment plan for your child. If you yourself are anxious or fearful “of the dentist,” don’t relay that to your child. Always talk positively about dental visits. Bring them in first thing in the morning so they are energized, instead of day when they may be cranky. At Longworth Dental, we will be at your and your child’s side every step of the way. If you are searching for pediatric dentistry in Bowmanville, we’re glad you’ve discovered us. Call us to find out how we can help — we’d love to hear from you! From the moment you walk in to our bright, spacious, and welcoming office at Longworth Dental, any fears you may have about “going to the dentist” will quickly melt away. Our friendly team will cater to the oral health needs of your entire family (we really love kids!). Whether it’s your first time visiting us, or you’ve been a loyal patient for years, we will always treat you with the utmost level of respect, understanding, and compassion at every appointment. We offer an extensive range of services — no matter where you are in your dental journey — all under one roof! In our state-of-the-art Bowmanville dental practice, Dr. Sharon Barr and Dr. Andrew Cooper can make sure your child’s smile is developing the way it should, with early intervention and periodontal care. We stay on top of the latest advancements in technology to provide you the best care possible. For example, our new 3Shape TRIOS 3 Wireless intraoral scanner instantly generates a 3D impression of your mouth and projects it on a screen — so you can see exactly what we see to better understand how treatment will make a world of difference. This makes same-day dentistry possible and enhances our patients’ overall experience and eliminates the need for bad-tasting putty impressions. If you are a gagger, this will definitely benefit you to replace impressions. If you’re looking to brighten — and enhance — your smile, we make that happen with a full lineup of cosmetic treatments. These include custom teeth whitening options, tooth-coloured bonding, veneers, crown lengthening, and Invisalign®. When it comes to preventing dental injuries and disease, we will address any concerns you may have. We design custom-fitted mouthguards for active preventive lifestyles, offer oral cancer checks, remove wisdom teeth, and more. Since patient education is very important to us, we make a point of showing and explaining how to properly care for your smile long after treatment. We want all our patients to maintain their new-found smile for a lifetime — and that is possible with daily care and regular checkups. Have a dental emergency? We are here to help with same-day appointments. Give us a call today to find out how we can help you get results … and keep the smile that stops everyone in their tracks! On The Lookout For Cracked Teeth! If you have a cracked tooth, you may not think it’s an emergency. However, the longer you wait, the more difficult it can be to fix. What begins as a small crack — like a chip in a windshield — can spread and get much worse. So, in the best interest of your smile and comfort, we encourage you to schedule a stress-free appointment with us as soon as possible. Teeth are protected by a hard outer layer — enamel. Think of enamel as a personal bodyguard for every one of your teeth. Unfortunately, environmental factors and diet can weaken the enamel and make the tooth prone to decay, chipping, and cracking. Over time, with wear and tear, teeth with larger fillings in them can also develop cracks. Small cracks may not have any symptoms but all. But eventually, you may experience sensitivity to hot and cold foods/drinks (ouch!) and feel pain when biting down. How can you prevent cracks? Brush twice daily and floss once a day to protect against cavities. Fluoride can help restore enamel weakened by acidic foods and bacteria, thereby making enamel more resistant to fractures. It’s found in toothpastes, mouthwashes, and in the tap water of many municipalities, including ours. Don’t put your teeth under undue stress, which means avoid biting your nails or using your teeth as tools to open packages, and don’t chew ice. Wear a nightguard if you grind or clench your teeth in your sleep. We can make one right here at the practice that is customized for your unique smile. Come for regular dental exams for us to check if cracks are starting. If they are, we can monitor them or act quickly, depending on their extent. Regular dental checkups are a must to identify problems early on so they can be treated before they progress into something more serious. At Longworth Dental, we will examine the affected tooth and take an x-ray to determine the extent of the crack. If caught early, we can place a crown to protect the tooth, like a helmet would. If the crack is deep, other options will be considered, such as replacing the tooth with an implant. We can help! Our Bowmanville dental team is just a phone call away. We’d be pleased to meet with you and help you prevent any further damage to your smile. In most cases, the earlier you catch damage, the easier (and less costly) treatment will be! Did you know that in 2017, Health Canada reported that 6.4% of adult Canadians have no natural teeth? That’s over 2 million people! Needless to say, tooth loss isn’t an uncommon occurrence. So, if you’re one of these people, there’s no reason to feel alone. And best of all … your smile can be restored to its former glory! In this article, we’ll tell you how Dr. Sharon Barr and her team can complete that beautiful smile. Genetics — For some people, an adult tooth doesn’t form during childhood. Cavities — A cavity can go deep enough that the tooth’s structure is compromised and it has to be removed to prevent pain and further oral damage. Injury — Whether you’re an athlete or participate in other physical activities, there’s a chance you’ll lose a tooth to injury. Only handle the tooth from the top – it’s crown. NEVER grab it by the roots. Only if possible … place the tooth back in the socket. If you’re unable to do so, put it in milk or saline solution (the same stuff contacts are stored in) until you access emergency medical care. As a last resort … put the tooth back in your mouth, between your other teeth and cheek. Don’t let it dry out. Seek treatment from Dr. Sharon as soon as possible! The most successful treatment (50% success rate) is when a tooth is replaced in the first hour. Call us at 905-697-0707. We’ll assess the damage and present a treatment plan that works best for you. It’s important that you are able to avoid discomfort or difficulty chewing, talking, or smiling! Implant-Supported Crown — The most common option when one tooth is lost. 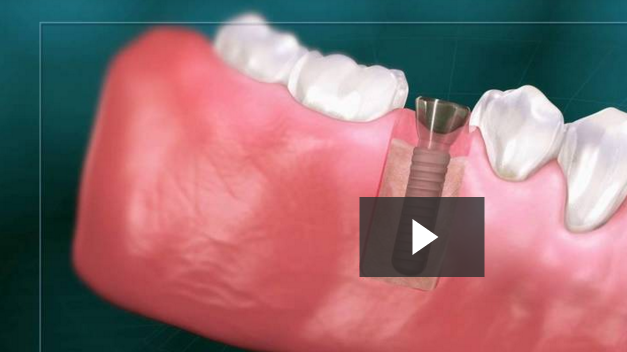 The implant acts as an artificial root, anchoring the replacement tooth in place. 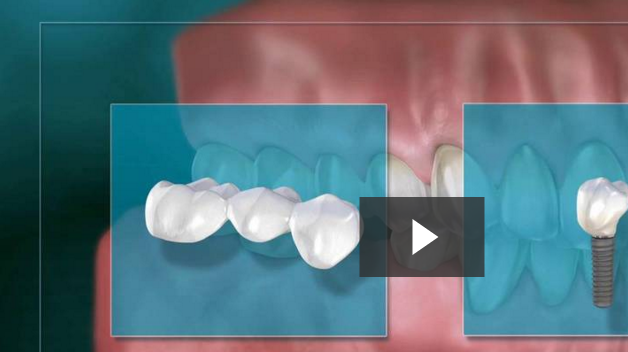 Bridge — A bridge introduces a replacement tooth into the missing tooth’s place. It is made of ceramic or composite material and uses teeth on either side for support. It also makes the tooth good as new – it functions and looks just like your original tooth! 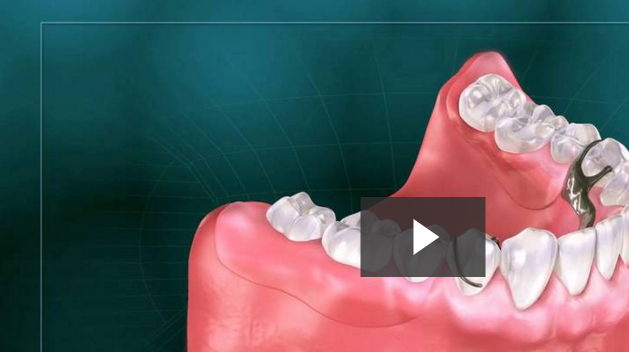 Dentures — When a patient’s condition doesn’t allow for other options, removable partial dentures are the way to go. Dentures are replacement teeth that are mounted on a base and wire frame which is removable for cleaning. Don’t let missing teeth hold you back! Get in touch us – your friends at Longworth Dental. We’d love to help you get your beautiful and fully functioning smile back! We often see patients who ask if they should have their wisdom teeth removed. The first thing we mention is that this is a decision that you need to make while referring to the advice of your dentist. However, there are some things you can think over in preparation for having an informed discussion with your dentist about your oral health care. In my years as a dental receptionist, I have met my share of patients who have wisdom teeth. Wisdom teeth are an extra set of four molars that most people have. I remember meeting one patient who had nine extra molars, which is very rare. Most patients have four, but there are cases where there are fewer. A lot depends on your genetics, and if Mom or Dad had only two or three, the chances go up that you might have the same. Also, it is interesting to know why we have wisdom teeth in the first place! I'm Thinking About Getting My Wisdom Teeth Extracted. Does My Age Matter? This is a particularly good question for parents of young adults who are in the position of needing them removed. Wisdom teeth develop and can be removed when you are as young as 16 years of age. Removing them at 16 is much easier than leaving them until you are older. As you age, the roots of the wisdom teeth start to grow, and more of the root the bigger the issue. For example, my oldest daughter had her wisdom teeth removed when she was 16, and this was done under IV sedation. So she was unconcious through the whole procedure, and did not remember a thing. She had no complications, and recovered with no issues. My youngest daughter decided she would put it off as long as she could, and had them removed at 21 years of age. Perhaps because the roots had an extra 5 years to grow, her experience was a bit more eventful. Although she also had the IV sedation, her recovery time was much longer, and she experienced some slight complications. My advice to Mom and Dad is to have your dentist check the progress of your children’s wisdom teeth at their next visit. If the teeth are causing pain, ask if it would be too early to think about removing them. Generally, the rule of thumb is "the earlier, the better". Should I Think About This Sooner, or Later? I see so many children who are covered under their parents' insurance, and are covered usually to the age of 21 and 25 as full time students. Keep in mind that dental insurance coverage is different for each family, and the age limit for your children could vary. Your dental receptionist should be able to check that information for you and advise you of the findings. For those kids who are insured by Mom or Dad’s insurance and have wisdom teeth, you are in for a big surprise if you don’t take advantage of that while you are covered! In cases where wisdom teeth become infected, they often will not subside until you have them removed. During my years of experience, I have seen a lot of patients that wish they would've had them removed while Mom or Dad's insurance could cover the bill. My words of advice are, “have those dreaded wisdom teeth removed while you are covered.” If you put it off, paying out of your pocket could cost $2500 or more. No one wants to pay out of their pocket, especially for something that they could have avoided while their are under their parents' insurance. So now the bottom line: if you are experiencing pain, don’t put off the removal of those wisdom teeth. Be sure to check with your dentist at your next visit if it is time for them to be removed, and take it from me, you will not have any regrets. If I can be of any help with regards to your wisdom teeth or just dentistry in general, please don’t hesitate to stop in and see me at Longworth Dental. This is part 1 in a series of articles for business owners in the Clarington and Durham areas on small business website development. From the moment your small-business starts searching for a professional who can design a new website for you or who can update your existing site, you will constantly hear about the importance of marketing your business on the web. However, it is often difficult to separate the professionals from the enthusiastic amateurs. In this series of articles, I hope to show you some of the steps involved in creating a website, while sharing some of the pitfalls to look out for. Step #1: Don’t Want to Have to Buy Your Small Business Website Domain Back? Register Your Domain Yourself. There are tons of sites where you can buy canadian domain names. The Canadian Internet Registration Authority (CIRA) maintains the registrar list here. At the time I registered, GoDaddy was the only place I could register a “.ca” name, and I haven’t switched, despite this scandal or this more recent incident. No matter if you hire another company to do contract work for you down the road or if you end up doing the work yourself, it is extremely important that you register your own domain for your small business website. Once you register your domain name, it is yours for as long as you keep paying your registrar. There are are number of web design companies out there who will tell you that they will register your domain name for you for free. If you already own your domain name, they might say that you need to transfer it over to them to make the design work easier. Unless you want to risk an expensive buy-back of the domain later on, find someone else to work with. Search engines like Bing and Google currently give special preference to domain names that contain exactly the search terms your audience is looking for. Let’s look at a real life example. It took us a while before deciding on the name “Longworth Dental” for our clinic. We liked the connotations of the value of patients’ long-term investment in their oral health. Once we chose the name, the first thing we checked was whether or not the website and its variants were available. GoDaddy offers a bulk registration tool that helps you quickly check the availability of the domain name you are looking for, as well as its variants, such as .com, .org and .ca. We took the .com and .ca versions, because we are a small business, but the bigger your company is, the more important it is to register the other variants of your domain name. While you are at this stage, also have a look at other keyword-rich and exact-match domains in your niche. For example, if you are a dentist in Bowmanville, you might want to purchase: bowmanvilledentist.com, bowmanville-dentist.com, bowmanvilledentists.com, bowmanville-dentists.com, dentistinbowmanville.com, and so on (as well as the .ca versions). At the same time, don’t get obsessed with it. There is still some debate on how important these top level domains really are, as well as how much importance they will continue to receive in the future. Keep track of your expenses, and if things start getting out of hand, start asking yourself if your money would be better spent elsewhere, or donated to a local sports team. The next thing you’re going to want to do is to register your social accounts. Want to know which account names are available for your business on which social sites? KnowEm makes it easy. They can also set up all the accounts for you (for a fee). Next, set up a dedicated e-mail account for your company that you can use to verify all the services and profiles you are about to create. At this point in time, it is a good idea to start looking into a password manager like LastPass so that you can start generating unique, secure passwords for each site. Why the dedicated e-mail account? While using your personal e-mail account may be easier in the short term, it is better to be prepared for the day that you hand over your business to someone else. On that day, when they ask you to give them the passwords for your Twitter, Facebook, Bing and Google account with all the Webmaster, Insight and Analytics tools that come with them, you could spend a lot of time disconnecting those from your personal e-mail and transferring them over. Be careful with your Google analytics account (among others), because you may lose data associated with the website in the transfer. Even if you’re like me and you started setting up all those accounts up using your personal e-mail, it’s better to start changing slowly now than in a rush during crunch time later. One of the most frightening events for a child and parents alike is when an accidental trauma occurs in the mouth area. It could come as the result of a fall or being hit by a baseball, or any one of a number of other scenarios. Because such an event can happen virtually any time of the day or night, it is essential that parents have a "dental home" that they can call when emergency services are required. Here is a brief parents' guide for what to do when a child dental emergency arises. --Broken jaw: If it is obvious that your child has suffered a broken or fractured jaw, then an emergency room visit is in order. Otherwise, a good pediatric dentist with 24-hour contact for emergency services can handle most other dental emergencies in a non-threatening atmosphere and for significantly less cost. --Toothache: Toothaches can be caused by a variety of different factors including cavities and infections. Parents should gently floss around the tooth to determine whether the pain is simply being caused by trapped food. If the floss is clear, rinse the mouth with warm salt water, apply a cold compress, and call your "dental home:" preferably a good pediatric dentist. --Broken or chipped tooth: If there is bleeding, apply direct pressure to the gum just above or below the tooth (never on the tooth itself). Rinse the mouth and apply an ice pack to prevent swelling until you can get to the dentist. If possible, gather all pieces of the tooth and place them in a sealed plastic bag with a little water (not milk) and bring them with you to the emergency provider. --Knocked-out tooth: If it is a permanent tooth, rinse the tooth with water without touching the roots and reinsert it gently into the socket, holding it in place with gauze. If it cannot be reinserted, place it in a plastic bag with saliva or plain water and take it with you to the emergency dentist. For a primary tooth, do not attempt to reinsert the tooth: but there will probably be a considerable amount of bleeding to attend to. Apply gentle pressure on the gums above or below the missing tooth: never on the wound itself. Contact a pediatric dentist right away when emergencies arise. If your child is into sports, having him or her wear a mouth guard appliance during play is a great preventive measure against accidental mouth injuries. Sports-related injuries account by far for the greatest number of dental emergencies, so having child athletes use mouth guards makes good common sense. No Dental Insurance? How to Make Dentistry Affordable. I don't have dental insurance and can't afford to go to my dentist. What can I do? And why does dentistry cost so much, anyways? If you don't have dental insurance, please do not delay going to your dentist until you are suffering with a horrible toothache. I know dentistry can be expensive, but preventative maintenance is the best approach to your dental care. If you wait until you are in pain, then the issue may be bigger and more expensive than if you'd gone before it started hurting. Get your teeth the attention they need when problems are small, and you will save yourself some hassle in the long run. Taking the initiative to visit your dentist for a check-up, a few necessary radiographs and possibly a cleaning is the best route to take. If you haven't gone in a while, the first visit may be more expensive. But once the initial visit is complete, your return check ups (whether they are 6 months, 9 months or yearly, as decided between you and your dentist) are much less expensive. This is because you have already established a chart and your return visits are on a preventative basis instead of a "new patient" basis. Read More: Why doesn’t my dentist just accept payment from my dental insurance company? Payment plans and individual dental insurance have been available for many years, and they work for many patients. The newest idea is plan 3, Dentalcard financing. This is a financial institution that offers financing for patients who are interested in going ahead with the treatment plan outlined by their dentist, and payment plans or dental insurance are not an option. They will work with you, and make arrangements best suited to your budget, and in turn, they will pay the dentist directly. Most offices will have pamphlets that will give you more information if needed. Now for the second part of your question, "why does dentistry costs so much?" My answer would be, like everything else in today's society, overhead is the biggest contributing factor. The cost of dental equipment, instruments, material used in restorative procedures, sterilization products which are most important in making sure you are looked after and all procedures are safe for you and the environment. The list goes on. These are the costs that the dentists incur so that they can make sure the office runs with precision and accuracy, and your care is utmost and foremost. There are no corners cut when it comes to overhead costs. The ultimate care of your oral health, the cleanliness of the clinic and the operation of the dental team is included in those costs. I hope I have answered your questions. Always remember that you are always welcome to stop in and visit if you have any others! I'll leave you with this piece of wisdom: "BE TRUE TO YOUR TEETH, AND THEY WILL NEVER BE FALSE TO YOU." Difference Between a "Treatment Plan" and a "Payment Plan"? A treatment plan is how you want your dentist to improve your oral health; a payment plan helps adapt your treatment plan to your financial situation. Why Does My Dental Insurance Leave a Balance When I Visit the Dentist? Dear Nancy, Why is there sometimes a balance when I visit the dentist? My insurance shoud pay 100%! Is there any way you can help me with this? For newborns, feeding time is holding time. Don’t put two-month-olds to bed with a bottle or sippy cup. From six months to one year, brush twice a day with water. For one-year-olds, there are a number of dentally appropriate, healthy snacks. If you have any questions or comments, please share below!